WASHINGTON, D.C. -- Americans' faith in each of three major news media platforms -- television news, newspapers, and news on the Internet -- is at or tied with record lows in Gallup's long-standing confidence in institutions trend. This continues a decades-long decline in the share of Americans saying they have "a great deal" or "quite a lot" of confidence in newspapers or TV news, while trust in Internet news remains low since the one prior measure in 1999. These results are from a Gallup poll conducted June 5-8.The three major sources of news ranked in the bottom third of 17 different U.S. institutions measured in the poll. Confidence in newspapers has declined by more than half since its 1979 peak of 51%, while TV news has seen confidence ebb from its high of 46% in 1993, the first year that Gallup asked this question. 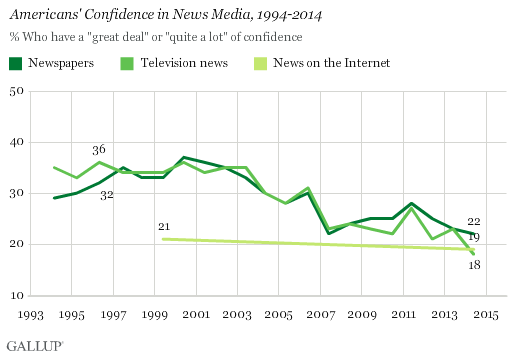 Gallup's only previous measure of Internet news was in 1999, when confidence was 21%, little different from today. Slightly less than one-fifth of self-identified conservatives (15%) say they have a great deal or quite a lot of confidence in newspapers, tied with the 10-year low. In the past decade, the percentage of conservatives expressing a strong degree of confidence in newspapers has fallen by nearly half. Liberals are far more likely than conservatives -- or than the adult population in general -- to be confident in newspapers (34%). 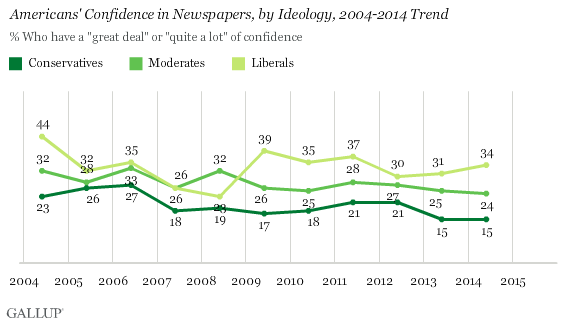 Nearly a quarter of moderates (24%), meanwhile, have confidence in newspapers. While liberals are more likely to have confidence in newspapers than conservatives, conservatives are slightly more likely to express confidence in TV news (19%) than liberals (15%). For liberals, this 2014 reading represents an 11-percentage-point decline from 2013. Over the past year, the Internet has seen the acceleration of website-only news sources that focus on empirical, data-driven analysis, including Ezra Klein's Vox website or the relaunching of Nate Silver's FiveThirtyEight site. But this quantitative approach to telling the news has not, in of itself, persuaded the major ideologies to express strong confidence in news from the Internet. More than a fifth of liberals (22%) and moderates (22%) say they have a great deal or quite a lot of confidence in news from the Internet, while slightly fewer conservatives (17%) say this. The field of news media has changed dramatically since Gallup first began measuring the confidence the public held in newspapers or TV news decades ago. The circulation of newspapers continues to shrink to the point that University of Southern California's Annenberg Center for the Digital Future estimates that most print newspapers will not exist in five years. Television news continues to see a proliferation of new cable news networks, including the launch of Al-Jazeera America in August 2013. Meanwhile, news from the Internet now figures prominently in the average American's news diet, whereas not so long ago this mode did not even exist. 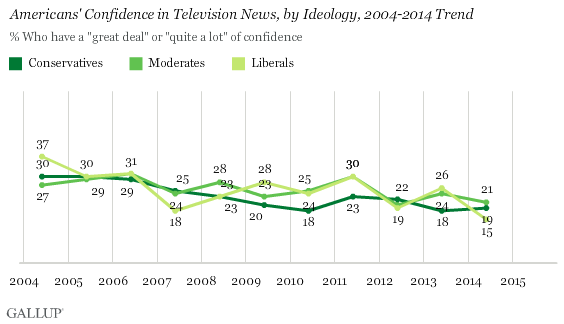 Amid this rapid change, Americans hold all news media platforms in low confidence. How these platforms can restore confidence with the American public is not clear, especially as editorial standards change and most outlets lack the broad reach once available to major newspapers and broadcasters. Results for this Gallup poll are based on telephone interviews conducted June 5-8, 2014, with a random sample of 1,027 adults, aged 18 and older, living in all 50 U.S. states and the District of Columbia. Media freedom is on the decline in many countries. Gallup surveys conducted in 132 countries and areas in 2013 reveal that a median of 63% of adults say the media in their country are free. The majority of Americans are not regularly contacted by political parties, candidates, or elected officials via mobile devices, suggesting that the potential of this new form of communication in politics has yet to be fully realized.